Success in any IT outsourcing strategy depends on choosing the right partner that will best meet the project IT skills, resources, and deliverable goals. A successful offshore outsourcing engagement relies on a robust methodology and process that can tackle the perceived risks of distance and control. WNA has built knowledge-based external competencies through alliances with strategic partners that offer specialized services and domain expertise in various verticals. 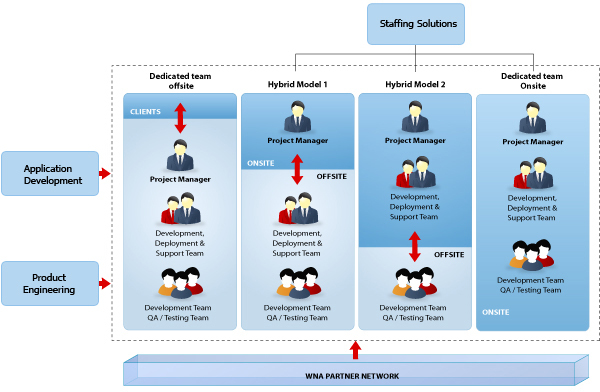 When WNA works with the client organization, we serve as a virtual extension of their enterprise. We evolve an engagement model suited to their requirements, so they can seize the competitive advantage and realize their business goals. Following engagement models are implemented by WNA to provide services in the best possible manner, executed within time and budget. These models provide value to the customer across the entire project lifecycle. Organizations can choose a model or a combination of models customized to their needs.